President Xi Jinping stands behind a ballot box after submitting his vote on an amendment to the constitution abolishing presidential term limits, during a session of the National People’s Congress at The Great Hall of The People in Beijing, March 11, 2018. This article was first published in the May 10, 2018 issue of The New York Review of Books. In 2023, Xi Jinping will conclude his second term as China’s president. Ever since Deng Xiaoping revised the country’s constitution more than 35 years ago, two consecutive terms have been the most that a president can legally serve. But it has become increasingly clear that Xi has no plans to retire. In March, the National People’s Congress—a rubber-stamp body with no real legislative power—approved a constitutional amendment that abolished term limits for the presidency, effectively clearing the way for Xi to hold the position indefinitely. It was a step that caused despair among Chinese liberals and alarm among commentators outside China. The Washington Post published two pieces on consecutive days speculating that Xi was setting himself up to be China’s first “leader for life” since Mao Zedong died in 1976. Xi has emerged as Mao’s revenge on Deng. Deng did what Mao feared his successors would do—bring an end to permanent revolution—and Xi is doing what Deng feared his successors might do: restoring one-man rule. But the abolition of presidential term limits is actually one of the less consequential steps in Xi’s centralization of power. The presidency (or state chairmanship, in Chinese) has been a ceremonial position, superior in rank but inferior in authority to the position of premier (currently held by Li Keqiang). Articles 80 and 81 of the 1982 People’s Republic of China (P.R.C.) constitution provide that the president “promulgates statutes, appoints or removes the Premier,. . . confers State medals and titles of honor,. . . receives foreign diplomatic representatives,. . . and ratifies or abrogates treaties and important agreements concluded with foreign states.” Mao, who was Party chairman—as the top Party post was called at that time—until the day he died, held the presidency for only a short time after the first P.R.C. constitution was promulgated in 1954. He soon yielded the position to a less influential official, Liu Shaoqi, purged Liu in the Cultural Revolution, let the presidency lapse, and finally had it eliminated in a new constitution in 1975. In 1982, Deng reintroduced it in the P.R.C.’s fourth constitution. To help keep power struggles like those of the Mao years from recurring, he imposed a two-term limit on both the president and the vice-president. As a rising power, Deng realized, China needed a head of state who could meet as a counterpart with other heads of state. This remains the most important function of the post today. Even so, secondary figures in the leadership fulfilled it until Jiang Zemin, the Party leader after Tiananmen, restored Mao’s early practice of uniting the top Party, military, and state offices in one person. That practice was followed by Jiang’s successor, Hu Jintao, and now by Xi, who is at once Party secretary, military commission chair, and state president. The abolition of term limits was therefore more important symbolically than practically. It was Xi’s first explicit repudiation of the orderly system of succession Deng had developed. At each level of the bureaucracy, Deng set an age limit after which an official was considered too old to be promoted, thereby assuring rapid movement up the career ladder for those considered most promising and giving the country a relatively young leadership. He also instituted fixed retirement ages for Party and state officials, and set a personal example by refusing to serve as head of either Party or state, although he did serve for eight years as chair of the military commission. (Younger leaders nonetheless still insisted that he make the final ruling on major issues, which led to his approving the military crackdown on pro-democracy demonstrators in the 1989 Tiananmen crisis.) The system of age-based retirements evolved into a tacit two-term limit for top Party posts, which turn over every five years at a fall Party Congress. (State posts change at the National People’s Congress the following spring.) Under this informal norm, senior leaders were not eligible for reelection to the Politburo after the age of 67, and since the Party secretary serves as military commission chair, this effectively set age and term limits for that position, too. Until now, Xi’s ascension has followed the script. In 2007–2008, at the age of 54, he was appointed a Politburo Standing Committee member and vice-president, and in 2010 deputy chair of the Central Military Commission—a combination of offices signifying that he was Hu Jintao’s heir apparent. In the fall of 2012 and the following spring, at age 59, he became the top leader. Now, at the age of 64, he has been elected to his second set of terms in all three of the offices he holds. Meanwhile, Xi has been steadily consolidating control of the Party and the state. He has now become more powerful than any previous Chinese leader. He is not portrayed as a god, as Mao was, only as a wise and decisive manager. His words have not yet been called “magic weapons,” only directives that must be followed. But whereas Mao was constantly embroiled in power struggles, Xi benefited from the fall of his most potent rival, Chongqing Party Secretary Bo Xilai, on the eve of taking power; used his anti-corruption campaign over the following two years to clean out Bo’s network; sapped the independent authority of his premier, Li Keqiang; incorporated technocrats from other factions into his leadership group; broke up local patronage networks; and held anti-corruption dossiers of family members over the heads of retired senior leaders who might have tried to check him behind the scenes. Well over a million Party members have reportedly been disciplined for corruption under Xi, including more than 170 at the deputy minister level and above. On the eve of the 19th Party Congress last October, the anti-corruption commission detained a rising star who would otherwise have been seated in the Politburo, Sun Zhengcai, whose real crime was insufficient enthusiasm for Xi’s leadership. There is no visible dissent from Xi’s line and no one with the official standing or base of support to challenge him. And whereas Mao’s attention to policy issues was episodic—he retreated from the front lines of policymaking for long periods, then intervened disruptively when he thought other leaders were moving in the wrong direction—Xi has a relentless work ethic and has taken over day-to-day direction of every important policy area. In his recounting of P.R.C. history, Xi has cannily smoothed out the zigzag line that connects the disastrous Great Leap, the tragic Cultural Revolution, the twists and turns of Dengist liberalization, and the post-Deng creation of a fast-growing quasi-market, quasi-statist economy. Deng had allowed the cautious acknowledgement of Mao’s crimes with the formula that “mistakes amounted to only 30 percent and achievements to 70 percent.” Under Xi, even such tempered criticisms of the “first 30 years” have disappeared from media and textbooks. The 70-year history of the P.R.C. is presented as an arduous but triumphal progress toward modernization. Xi credits Mao with “crea[ting] the fundamental political conditions and the institutional foundation for achieving all development and progress in China today” and Deng with “launching the new great revolution of reform and opening up.”1 He passes in silence over the more than 20 years during which the country was ruled by Jiang Zemin and Hu Jintao—now viewed (unfairly) as a period of stagnation—and announces the arrival of a “New Era” in which the goal is to create a “moderately prosperous society” by the hundredth anniversary of the founding of the Chinese Communist Party in 2021, and a “modernized socialist society” by the hundredth anniversary of the establishment of the P.R.C. in 2049. This is a tale of three modernizers. But Xi’s “dream” of “rejuvenating China” differs from those of his predecessors in his passion for order, a value shared neither by Mao, who loved chaos, nor by Deng, who liked to experiment. Xi has unpacked the contradiction in Mao’s thought between chaos and conformity and has chosen conformity; he has rejected Deng’s acceptance of the fact that human nature is unalterably selfish but embraced Deng’s faith that prosperity will create stability. When Xi calls for a merger of “core socialist values and fine traditional Chinese culture,” he is imagining a utopia in which citizens fed and protected by a benevolent state automatically honor the Confucian “three bonds” of loyalty to father, ruler, and husband and “five virtues” of benevolence, righteousness, propriety, wisdom, and trustworthiness. It is an organic society in which no one has any valid reason to be dissatisfied. To bring such a society into existence, Xi’s colleagues in the security apparatus have mobilized street-corner observers, installed surveillance cameras, and created a “social credit system” that grades people’s social fitness based on a wide range of their personal data. Rumors started about two years ago (they must have been planted) that Xi intended to stay on as Party secretary beyond two terms. At the Party Congress last October, he started his second term by placing 14 of his closest followers in the 25-person Politburo. No member had the right combination of status and age to be his designated successor. By abolishing term limits for the state presidency now, rather than at a future meeting of the People’s Congress closer to the end of his second term, Xi was reinforcing a message he has been sending to the bureaucracy since the day he took power. As he put it at the Party Congress: “Follow the leadership core, keep in alignment, and uphold the authority of the Central Committee and its centralized, unified leadership.” Doubting or evasive officials up and down the Party-state system are on notice. Xi will be around for at least another 10 years, and even for the tertiary post of president he will not contemplate a strategy like Vladimir Putin’s use of Dmitry Medvedev as a stand-in to duck his presidential term limit. 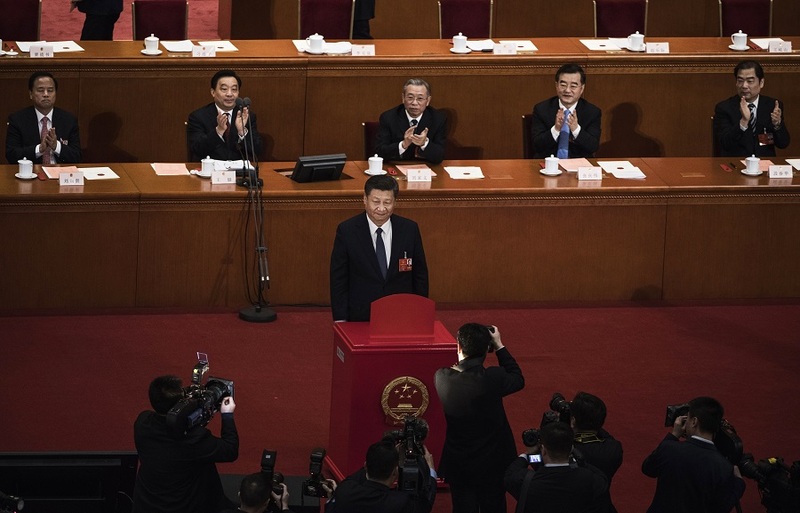 In October, Xi added a phrase to the list of guiding orthodoxies in the Party’s constitution: “Xi Jinping Thought on Socialism with Chinese Characteristics for a New Era.” In March he had the National People’s Congress write the same phrase into the state constitution. His loyalists on the Politburo have been double-hatted with important positions in the state system. Liu He, a friend of Xi’s since middle school, will be in charge of the financial sector, and Li Zhanshu, his follower for three decades, will chair the National People’s Congress. Xi’s ally Wang Qishan, who prosecuted the anti-corruption campaign Xi spearheaded during his first term, was elected vice-president despite the fact that he has passed the informal age limit for that post. Wang is expected to help Xi with major foreign policy problems, especially relations with the United States. The People’s Congress also approved a series of major reforms to the vast government bureaucracy designed to get Xi’s policies implemented more effectively. It created the State Supervision Commission, which will be staffed almost entirely by the same Party officials who staffed the Party Discipline Inspection Commission. Run by the Xi loyalist Yang Xiaodu, who was a Party Commission deputy secretary under Wang Qishan, the Commission will continue to investigate, interrogate, and detain suspects without due process, as the Party Commission did. But now it will target not only Party members, but also non-Party state employees, a broad category that in China includes civil servants, university and hospital staff, state enterprise managers, and many others. And the congress reorganized and consolidated government agencies up and down the line. Lines of authority between levels of government are being simplified. Xi’s vision of a new era is far from the society he rules today. After 40 years of explosive growth, the Chinese are striving, dissatisfied, and anxious. They suffer from a spiritual crisis that has led to a rise in religious practice and from tension between the government and the ethnic minorities. And yet the government is widely popular among broad sectors of the population, many of which have experienced dramatic improvements in their material lives. Xi has built on the efforts of his predecessors to expand the social welfare system, improve health care, raise the incomes of rural people, and enable some rural residents to get urban residency permits. At the congress in March he launched a new veterans’ affairs ministry to do a better job of solving the livelihood problems of retired and demobilized soldiers. When Xi says that “Party leadership is the fundamental guarantee for ensuring that the people run the country,” what he has in mind is better delivery of services. He acknowledges that much more is needed. In his speech at the last Party Congress, he instructed his colleagues to concentrate on solving a “new principle contradiction” between “unbalanced and inadequate development and the people’s ever-growing needs for a better life.” To resolve this tension, Xi has had to remake all three of his instruments of power: the Party, the military, and the state. The anti-corruption campaign in the Party has been the most publicized part of this effort. Xi has also restored traditional rituals of “Party life,” such as the collective study of Party documents and regular criticism and self-criticism. Promotion within the Party is increasingly based on “political performance,” which is defined as “following the leadership core and keeping in alignment with the central Party leadership.” The Party’s new propaganda chief, Huang Kunming, a Xi loyalist, will intensify the promotion of Xi’s image and exhortative ideology. Less widely noted but even more dramatically, Xi has reorganized the military, which has traditionally been a land-based force entrenched in seven “military regions,” incapable of joint operations, and infested with the sale of promotions and kickbacks from the acquisition of weapons and supplies. The anti-corruption campaign in the military has taken down a reported 13,000 officers, including a hundred generals, enabling Xi to restaff the top leadership with younger, more fit, and more loyal senior officers. In 2014 he launched a sweeping reorganization initiative that involved turning four formerly independent operational headquarters into departments within the Central Military Commission, demoting the command of the historically dominant land forces to the same level as those of the navy and air forces, adding an additional service command, reorganizing the seven military regions into five theater commands, and demobilizing 300,000 soldiers. On the state level, much of Xi’s attention has been on economic reform. In the last five years, the Asia Society Policy Institute and the Rhodium Group have found, China made substantial progress on only two of the 10 reform goals that Xi announced at the start of his reign. These lagging goals will now be more forcefully addressed, chiefly under the heading of a program called Supply Side Structural Reform. Unlike supply side economics in the United States, this program calls for intensified state intervention in the economy in order to reduce the oversupply—in construction materials, housing, bank credit, and other areas—that now raises risk, lowers productivity, and causes waste. Xi both repeats an earlier slogan that “the market will play the decisive role in resource allocation” and signals that the state will keep guiding the market, supporting “champion” state enterprises, and investing in so-called new economy fields—robotics, new energy vehicles, big data, artificial intelligence, and the like—that have been identified as priorities in the ambitious “Made in China 2025” program announced in 2015. Meanwhile, he is putting pressure on nominally private enterprises, whose prosperity is tied to official patronage, to reduce their overseas investments and invest instead in targeted poverty reduction programs and cutting-edge technologies at home. Overall, Xi is making the institutional system he inherited from Mao and Deng more responsive and efficient. But he has reversed the attempt of the period between Mao and himself to do this through rule of law. As Carl Minzner notes in his recent book End of an Era: How China’s Authoritarian Revival Is Undermining Its Rise, “Law is becoming less and less relevant to China’s future.”2 Instead, Xi is creating a 21st-century “organizational weapon” of the kind described 70 years ago by the sociologist Philip Selznick—one that works through “disciplined and deployable political agents.”3 The agents are accountable not downward to their constituents or horizontally to legal institutions, but upward, to their superiors. The system pushes problems to the top, until they reach someone who is willing to take responsibility. Xi has emerged to shoulder this burden, and he has the personality to do so. That is why many in the Party have welcomed the reversal of the Deng system, which they believe led to stagnation. But human rights lawyers, feminist activists, academics, journalists, as well as Party and state officials themselves have found their freedoms drastically restricted. The surveillance regimes in Tibet and Xinjiang have been intensified under a hard-line Party secretary, Chen Quanguo, who was rewarded in October with a promotion to the Politburo Standing Committee. Even the broad sectors of the population who support the regime as the economy grows no longer have the revolutionary fervor of Mao’s time. It has been buried by consumerism, foreign travel, and the Internet. Chinese are proud of what China has achieved, but obeisance to the Xi cult is more form than faith. So long as Xi continues to achieve great things, the Chinese people will be grateful. If he stumbles, they will turn on him. Meanwhile, for intellectuals, activists, and national minorities, his China dream increasingly resembles a 21st-century, high-tech, less bloody version of Mao’s China.